29-year-old Eli Borntrager was killed on the road last year in Missouri. Borntrager’s buggy was rear-ended by a driver traveling at 70 mph. The Amish buggy is not the safest form of transport. For many reasons. Buggies can be difficult to see. Horses can spook. With their long bodies and front-set position, horses create a tougher sight angle when attempting to cross an intersection. They also lack the acceleration “punch” of a car. Some communities, of course, are more dangerous than others. Lancaster is packed with traffic. Holmes County’s winding roads and steep hills create visibility hazards. In contrast, a place like Arthur, Illinois has relatively low automobile traffic, few curves and flat terrain. Both Amish and highway authorities take precautions. Amish in Lagrange County, Indiana enjoy a full lane-sized shoulder on larger highways in the community. You sometimes see dirt lanes cut through a piece of farmland, bypassing a dangerous part of the road. Or a buggy pull-over lane, like in the hilly Munfordville, Kentucky Amish community. 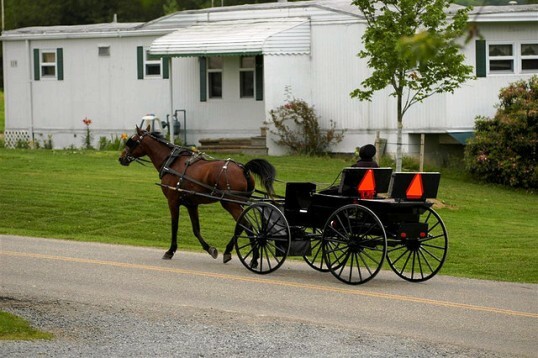 And all Amish buggies use forms of lighting and/or reflectors. Most are fairly-to-very-well lit-up (though not all). Amish, of course, aren’t the only ones at risk on the road. Nor are they always faultless in accidents. One study found buggy driver error to account for a number of crashes. This typically occurred when an Amish driver crossed an intersection at an unsafe time. Non-Amish have been injured or killed. Last June, a 91-year-old man walked out of a restaurant and was fatally struck by a horse-drawn cart (in, as it happens, Arthur, Illinois). In response, a writer for a St. Louis paper claimed “the only logical conclusion” to be that “the Amish need to keep their horse-drawn buggies off the road”. Yet motor vehicle driver behavior likely plays a much bigger role in accidents. High speeds and alcohol are often found to be contributing factors, as is “following too close”. And modern technology may only complicate things further. It’s possible the driver who struck Eli Borntrager was texting at the time. 17 responses to Buggies off the road? Hi Mona, buggy speed can vary but 6-8 mph, maybe 10 mph. And Amish don’t want gas prices to go up either 🙂 Some of the businesses use a lot of diesel for instance. All buggies should be required to carry several pounds (or more!) of high explosives on the back of their buggy. Automobile drivers would soon learn to be a lot more cautious! seemsto me, from reading this ridiculous post You have a disturbing hate of the Amish people. I suggest you take a different route so you dont “bump”nto them. Cars need to slow down when they know there is Amish buggies in the area. Oh wait here is an idea. Drivers of vehicles are alert and aware of their surrounding, use common coutesy to others. The Amish has a right to their transportation as much as we are. That is their American right. i was born and raised around the ashland, holmes county amish! i am english and i believe that if every motorist had to give up thier vehicles and use horse and buggy for one year they would quickly learn that nothing is worth rushing for or acting like idiots on the road. in my opinion the horse and buggy has the right to be there not the vehicles. people tend to complain about farmers on the roads with their tractors too. the way i see it everyone wants to point the finger until it happens to them!! and i for one am considering the idea of using horse drawn myself. Seems that folks want to keep saying “buggy awareness” but I grew up in a rural farming community and we rode bicycles or we walked; what about rounding a corner or cresting a hill to find large livestock in the road with a child or two trying to round them up? Or, a group of scholars walking to school. Or, like yesterday I came across two young boys pulling a wagon with a water trough strapped down with bungee cords – now that was distracting! Drivers just need to be less distracted and focus on their surroundings. I am not by any means overly cautious when driving. I have come upon SMV’s only to be startled right out of my seat. We are all preoccupied to some extent. Some of the distractions come in the form of the scenery we are enjoying – cows, stooks, or a barn raising. But for heaven’s sake – wake up drivers! On a major road you take the chance of being pulled over for fast driving, don’t take advantage of a country road to hone your grand prix skills. And with all that said – there are some irresponsible buggy drivers as well! Well said Maggie. Not the only obstacles on the road. I am a believer in good old fashioned defensive driving. To the point about buggy drivers I would just add that sometimes the horses are not always as road-worthy as their owners might like them to be. There are people on this site that know better than I that horses are different…and I do think you get what you pay for. Some animals are seen as “project horses” which require extra training for whatever reason to get them to road-worthiness (if they ever get there). On my last visit to PA a friend was trying to train a rather stubborn one in that was not as responsive as he should be to his commands. I don’t think it was the safest horse. Fortunately he had some relatively low-traffic backroads to work with. I wouldn’t feel too safe riding with that particular horse though. you know i have seen amish trying to train a horse that just retired from racing to be an everyday buggy puller! its like use we wanna get somewhere faster we soup up our rides seems they are doing the same lol but in my experience the safest way to get a horse use to the roar of semis and vehicles going screaming by is find someone that has a section of land right next to a rather busy highway and let them get use to it before they are put out on the roadways. None of you mentioned the problem of visibility. I live in Mifflin County PA and have to drive 9 miles out Big Valley to visit my mother. Buggies are devilishly hard to see at night, especially as many of them have only 2 small reflectors and the required slow-moving-vehicle triangle! 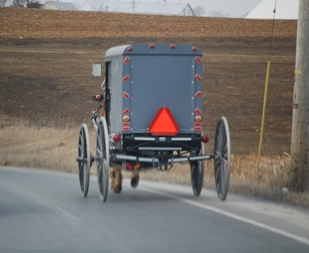 In the interest of safety, some now use battery-operated flashing red lights, an option I wish more Amish would adopt. 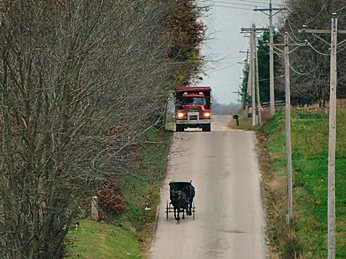 There are back roads available for the Amish to travel, yet they travel Route 655, the main road, instead, creating a problem for construction vehicles, semis, log haulers, etc. I do NOT speed, text, or drive impaired or distracted, yet a nighttime drive in the valley is a real challenge, so please do not place the entire responsibility for mishaps on ‘English’ drivers. I often drive through Big Valley going through Belleville on the 655 and sometimes traveling East or West Back Mountain Road through Barrville. I do notice the white buggies are harder to see because they do not use battery lights but I do notice the reflector tape pretty quickly. I have never had a problem seeing buggies at night. Never. Even with the black ones, the lights, triangles, and reflectors show up well. I also don’t drive above the limit, or impaired, or using a phone or whatever. When I’m out there on business, I like the peace & quiet. Interestingly enough, many of the log trucks, construction crew vehicles are in Big Valley BECAUSE of the Amish. There are a lot of sawmills, pallets shops, and kilns that are Amish owned and operated or depend heavily on Amish employees. It’s this very fact that takes me to many Amish communities on business. Check out the truck traffic on Green Lane, Barrville Rd., and East Back Mt. Rd. — it’s mostly back roads but heavily traveled by trucks buying & selling lumber related cargo to or from Amish owned businesses. So the Amish who live on 655 or visit friends or family, attend church or whatever, shop in the badly-in-need-of-business town of Belleville or got to the Belleville auction are supposed to avoid town? Sorry, but I find that attitude offensive. There is room on those roads for responsible drivers of both cultures. I do Amish-hauling or taxi work and have for the past 16 years. I’m on all the roads in the Valley from Milroy to Allensville year round at all times of the day in all kinds of weather. I’ve been out in fog where it IS harder to see anything but I have not yet had any trouble spotting buggies on the road day or night. I mean, if you can’t see a bright yellow buggy with an orange SMV on the back and flashing red & orange lights, maybe you should not be out driving! The only accidents I’ve had were with a 17 yr. old “English” girl talking on her phone while driving and a small boy who drove his bike out in front of me. I drive carefully knowing I’m sharing my roads with me fellow-citizens in cars & trucks, buggies, driving big tractors and farm machinery, people jogging or walking, scooters & bikes, and more. The 655? Plenty of room for all of us who want to use it and drive responsibly. They (Amish) have been here since the 1700’s. I’m happy to share the road with them. My wife and I both drive the Valley roads every day. I drive a log-truck in the area and I don’t have a problem on the 655 day or night. What about the couple who was hit in broad daylight and killed on Sat.? They were hit by a lady who was texting while driving. Husband & wife killed leaving 12 kids behind. I see Amish on the 655 a lot. Kinda hard to do business around here and not go on it if you want the bank, doctor, grocery store, gas station or other businesses that depend on all of us here in the Valley to survive. Or should we just round em all up and put the Amish on a reservation? That would take care of the traffic “problem,” right? Duh! Sorry. I spent a great deal of my childhood in a rural area; and I thought being allowed to shoot through the radiators of obnoxious drivers would have been a *great* revision to the law. People used to come sailing around blind curves and then off the road when they discovered their was an entire line Bos Taurus marching across the milking parlor from the pasture. Then there was the driver who ran into a flock of sheep, killing some outright and injuring many more, some of whom had to be put down. He really didn’t understand why he was responsible for paying for the sheep, and the farmer didn’t owe him a penny for moving his sheep across a highway. Note that riders were posted down road from the sheep, but apparently the driver thought that the raised arm was either a greeting or a turn signal. Then there was my high school friend who was hospitalized for a concussion because someone decided to honk his horn to let her know he was going to psss her and a friend as they rode their horses well of the road on a wide shoulder. They had to ride in the same direction as traffic there as on the other side there was a shoulder of perhaps one foot wide bordered by a rather deep ditch, which meant riding in the traffic lane. Not all horses are good on the road; but a Standardbred harness horse off the track should adjust quickly. Unlike Thoroughbred running horses, they tend to a calm, relaxed temperament. It doesn’t make sense to me that anyone would want a Thoroughbred race horse to pull a buggy, in part because they often have issues with unsoundness, and because of their tendency to nervousness, they take a lot more feed to support their fidgeting. Horse drawn vehicles established the foundation of our highway system. Horses were still a major source of transportation in the 1960s. Whole most of the world has moved on, there is no reason to forbid those who choose to keep the old ways from being a part of our society. There may come a day when we clamor for the knowledge they cling to. And even if not, it is good to preserve reminders of our past in authentic and fully functional condition. Leave a reply to Buggies off the road? What if you’re Amish and homosexual?